Football is a game for men- tough men. Unlike many American males, I don’t lie to myself and others. I could not play that game professionally. It requires a physical toughness that I lack. It also requires an emotional toughness that I am familiar with as a pastor. In football, you have to deal with the emotional aspects of the game- remaining consistent when there are great hills and valleys. Remaining stable in the face of constant obstacles. Enter Jay Culter, the pouting All-Pro. Jay can’t seem to understand that Pro Football is a business. The goal is two-fold: compete to win the SuperBowl consistently, and make lots of money in the process. The closer you are to the first, the easier it is for a team to accomplish the second. As a result, the business-side, just like the game-side, is not easy on a person’s ego. During the game, fans might boo you. And during the off-season you might be linked with trade rumors. Jay can’t imagine that the Broncos might entertain offers for a QB that 1. his new coach knows, and 2. had a better QB rating than he did. Yes, Cutler had a record setting season. But his team folded in the crunch (Cassel’s team when on a strong run that would have earned them a playoff spot in most divisions). As QB, some of that falls on his shoulders. But Cutler is pouting and demanding a trade- feeling so unwanted. He’s is proving that they should have traded him. First, he lacks the mental/emotional toughness required to flourish in professional football. Trade possibilities have sent him into an epic, public freefall. He just gave fans on other cities ammo with which to bait him and boo him. Second, he is more concerned with himself than team. This doesn’t sit well with any associated with the Patriots and their success over the course of this decade. Individuals play, but only teams can win. Teams are made of people who believe “the needs of the many outweigh the needs of the one” to quote the fictitious Spock from The Wrath of Kahn. Cutler is focused on himself. Not a good sign. He demands his ego get stroked instead of submitting his ego to the needs of his team. He also refuses to see that a few teams WERE really interested in him (I’m not sure why at this point). Jay needs to take his meltdown where it belongs- behind closed doors- or no team will want him, including the one he’s on. And while he’s there he may want to invest in some Daniel Goleman books on emotional intelligence. First it was Tom Brady. His knee injury ended his season and their hopes for a return to the Super Bowl. Prior to Monday’s game it was announced that Laurence Maroney was done for the year with a shoulder injury. His injury is not as crippling to the team since they have plenty of running backs. If Sammy Morris did a bigger number on his knee than he did on the Bronco’s defense (racking up 138 yards in the FIRST HALF), then New England is in trouble. But if he bounces back, Jordan comes back, and they don’t have to rely on an undrafted rookie free agent, the Patriots’ running game can still be very productive. That means that Matt Cassel can be productive despite his superb ability to take a sack instead of dumping the ball off. 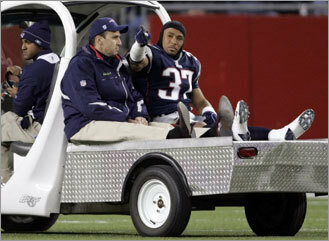 During the game Rodney Harrison was carted off the field. Word today is a torn quadriceps, and he’s done for the season- and perhaps his career. Football is a brutal sport. The Patriots are not the only team to suffer so many season-ending injuries. They can quickly put a cap on championship hopes (unless that player is Jeremy Shockey). There are no guarantees in life, and especially in sports. Injuries are part of the game, and affect the outcome of many a game or season. They humble us, or should. They display the fleeting nature of life, and the precarious nature of success. They also provide obstacles that can build character, or reveal weakness of character. Injuries also allow someone else the opportunity to rise to the occasion (think Tom Brady or Lou Gehrig). Life is just as unpredictable of those sports we follow. If anyone can find a way to motivate the Patriots after losing Tom Brady to a knee injury (torn ACL & MCL), it is the Master of the Mind Games, Bill Belichick. The stories are now out there of fans of lesser teams rejoicing that Tom Brady got hurt (so Middle School, folks). A Bernard Pollard Fan Club t-shirt is now available. These are just the right tools a guy like Coach B needs to motivate a team- they hate you, they think you’re done. You thought the Patriots were angry after “Spy Gate”, expect them to take this personally. Tom Brady is their leader, friend and face of the franchise. I expect most of them to rise to the occasion. If that translates into victories remains to be seen. But the opportunity is there. After going 0-4 in the preseason without any snaps taken by the NFL’s 2007 MVP Tom Brady, the Patriots (and their fans) greatest fear was an injury to their quarterback. That didn’t take long. On their second series a defender rolled up on his left leg while he was completing a pass to Randy Moss. Out, gone, start praying people. One sports injury expert, Will Carroll, suspects it is his PCL. Strain or torn, who knows. Amazingly, the Patriots pulled off a victory without their leader (17-10). They benefit from a weak schedule early on, so perhaps they can remain competitive while Tom’s knee heals. Update: Multiple sources are saying it’s a torn ACL, and Tom is done for the season. They reportedly have FA QB Chris Simms coming in tomorrow. That’ll be quite the drop off! This could be quite the long season. You’ve probably heard the story so much you want to bury your head in the sand. “SpyGate” has been a buzz since September, plaguing the Patriots all through their run for a championship. The day before the biggest game of the year, the SuperBowl and a chance to do the unthinkable- 19-0, the Herald released the story that took it to the next level. They ran a story claiming the Patriots had taped the Rams final walk thru prior to defeating them in the SuperBowl. You just can’t take something like that back. I don’t know if it affected the team. I know Tom Brady’s ankle and the Giants’ relentless pass rush were factors. This … hard to say. But slander and libel are still slander and libel. Real journalists should make sure their facts check instead of settling for the sensational. Tomase apparently didn’t, and neither did the editors. Other journalists caught doing such things in high profile situations (and this was very high profile) have paid the price. No word yet from the Herald beyond this short apology. I’m not sure that cuts it. In the Old Testament, if you falsely accused another of a crime you received the punishment they would have received. You really can’t strip the Herald of a SuperBowl, but perhaps they should donate a few million to the NFL Players Association to help the retired players who don’t receive the benefits now enjoyed by players. Perhaps Tomase and the editors need to spend endless hours answering questions how they could to something so heinous and reprehensible, and then be suspended for a year or two. Perhaps Kraft and Belichik should be given the opportunity to investigate their lives and print up some tasty tidbits. What do you think would be just in this matter? Annoying Update: Senator Spector apparently has too much time on his hands. The energy crisis and its ripple effect through the economy, the War on Terror, the Social Security crisis, our on-going infanticide (and I could keep going) don’t matter nearly as much to him as … football. There are serious matters that affect the country and he’s concerned about football. Someone please give him a reality check, like the daily paper or something. A$ante Samuel: Gone, signed with the Eagles. This is a blow to the defense, but creates a potential problem with the Eagles other starting cornerback, who makes considerably less money. He’s getting $20 million guaranteed. His 6-year deal is worth about $57 million, so I’m guessing it was the up front money the Patriots didn’t want to meet. Donte Stallworth: Gone, signed with the Browns for 7 years & $35 million. $10 million is guaranteed. He became the Patriots’ 4th WR by the end of the year. Not a great loss aside from the fear that they also lose Moss and really be up the creek w/out a paddle. Randall Gay: Gone, returning to Luisiana for a 4-year, $17+ million deal. He hurts the Patriots from a depth issue. But that is too much to pay for a guy who won’t be your premiere corner. I’m okay with this unless we get totally toasted in the secondary next year. Jabar Gaffney: ????? They continue to dialogue. Apparently interest around the league has been minimal even though he surpassed Donte Stallworth on the depth chart. He fits in well with the Patriots, and if he can be signed for a good deal, go for it (I’m sure Pioli is hanging on my every word). Eugene Wilson: ????? He is another guy who slipped on the depth chart, losing his starting job to James Sanders. Brandon Meriweather may be poised to take his spot. Keeping him would be for maintaining in depth. The Patriots have learned you can’t have enough safeties and cornerbacks. But, the price would have to be affordable. I suspect he is looking for a big pay day. It might not come. Rosevelt Colvin: ???? His release was a salary cap move. He was due a big bonus. His injury really hurt the Patriots late in the year. He could come back if they can find a middle ground financially. Coming off a foot injury, he may find a difficult market. Tedy Bruschi: Not Gone. He signed a multi-year deal. Yeah, he is getting old. But he is like another coach on the field. He is one of those guys who also has inestimatible value in the locker room. He’s one of the main advocates among the players of “the Patriot way”. Despite his age, this is a great move. Lonie Paxton: Not Gone. The tattoed long snapper is back. He likes it here, and likes winning. Long snappers don’t get mega-deals anyway. Larry Izzo: Not Gone. A special teams captain, he is an important part of the Super Bowl run. He’s some of the glue that holds the baby together. Kelley Washington: Not Gone. He’ll continue returning kicks for the Patriots (his primary value at this point), and may get a few receptions too if someone gets hurt. That may change with the signing of Sam Aiken. 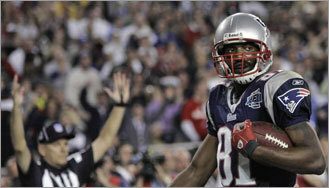 Randy Moss: Not Gone? A deal is supposed to be nearly done. We’ve heard similar things before, so it could always go wrong over something stupid, like “I want a full bag of peanut M&M’s in my locker before every game!” But this is the biggest piece of the puzzle for a return to the Super Bowl, and to make Tom Brady a happy man. This keeps the offense open, even if he doesn’t catch anything. Teams have to guard him and hope Welker, Gaffney, Watson and Maroney don’t beat them. Obviously they tend to beat you. Update: Done! 3 years & $27 million. But I think we are seeing that the Patriots are returning to the formula that made them successful before having such a stocked team last year. They built the team around solid, if unspectacular guys. It was about the team, and the system, not individual skills and glory. Last season was a blip, so to speak. It was a reaction to losing to the Colts in the final minute. But they just couldn’t do that again after losing to the Giants in the final seconds this year. Maybe they’ll bring Ty Law back (he got his guaranteed millions to watch the Chiefs stink) to shore up the cornerback situation. Next year’s team won’t run the table, but they will compete for a shot at another Super Bowl.